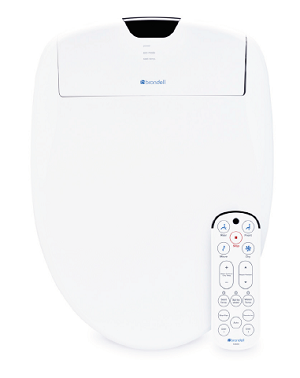 The Brondell Swash 1000 was Brondell’s flagship bidet seat for the past few years. But it looks like they’ve decided it’s time to phase out that model, and release a new luxury bidet seat – the Brondell Swash 1400. For those who aren’t familiar with the Brondell brand, their bidet seats are manufactured in Korea (one of the countries known for its high-quality bidet seats) for the North American market. They have a presence in both the US and Canada so they ship within North America and you would have no problems receiving pre- and post-purchase assistance. In this review, we’re going to take a look at the new Brondell Swash 1400 and tell you what we think about it! First we want to have a look at the design of the Brondell Swash 1400 in terms of its appearance, dimensions, and built. The Brondell Swash 1400 looks very similar to the Brondell Swash 1000. In fact, all the Brondells look quite similar to each other, and the same can be said about other brands too! So when you purchase a bidet seat make sure you double check the model number to make sure you get the right one! The Brondell Swash 1400 looks nice. We’ve always loved the clean, simple designs of Brondell bidets. With the Brondell Swash 1400 you’ll get a remote control. 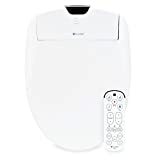 It seems like with new bidets, manufacturers are going for a curved, ergonomic feel for the remote control, so you’ll notice that the new remote control with the Swash 1400 has a curved design. The buttons are pretty standard, nothing new. Though we’ve always found the buttons on the Brondell remote controls to be nice and large, and not too cluttered, which is very nice. You have your wash buttons, buttons to control temperature and nozzle position, etc. But new to the Swash 1400, which the Swash 1000 didn’t have, you have the option to store user settings for two people. The Swash 1400 is available in two designs: elongated and round. If your toilet is an elongated toilet, it has an oval shape. If your toilet is a round toilet, it has a circle shape. Precisely, elongated toilets are about 18.5 inches long from the mounting bolts at the back to the front, and round toilets are shorter in length at about 16.5 inches. The dimensions of the elongated version of the Swash 1400 are 15.2” (W) x 20.43” (L) x 5.75” (H). The dimensions of the round version are 15.2” (W) x 19.55” (L) x 5.75” (H). The length is about an inch shorter with the round version to accommodate the shorter length of a round toilet. The Brondell Swash 1400 comes in white and biscuit (beige). The Brondell Swash 1400 is a luxury bidet seat and that means it’s packed with many features. For starters, it has a rear and front wash that’s standard for a bidet seat. However there are two nozzles and both of them are made of stainless steel so the quality is much better than bidet seats that have plastic nozzles. With the wash you can adjust the water pressure and water temperature, and there is an oscillation feature that moves around and provides a wider cleanse. There is also an aerated wash spray that works sort of like a massage but is a lot gentler. So as far as cleansing goes, you can expect this bidet to deliver a comfortable experience. The nozzles themselves have a self-cleaning feature where a small amount of water will flush over the nozzles. There is also a sterilization feature for the nozzles that will treat them to an anti-fungal and anti-bacterial wash for roughly 60 seconds. The “Sterilize” button on the remote control will activate this feature. It’s always nice to have additional cleansing features to keep things clean with relative ease, so this is great. There is a deodorizer to help keep things smelling clean too. Of course, as a luxury bidet seat you can expect comfort features like a heated seat and warm air dryer. An Eco Mode lowers the temperature of the seat to save energy. Some of the more advanced features that come with luxury bidet seats are also included in the Swash 1400. These are programmable user settings (which was already mentioned), a nightlight, and a soft closing seat and lid (but not automatic, unfortunately). One of the cool things we want to mention is that the Brondell Swash 1400 comes with a 3-year limited warranty, while most other bidets come with the standard 1-year limited warranty. During the first year, you’ll get 100% coverage of all parts and labor, during the second year you get 75%, and during the third year you get 50%. It’s always nice to have this extra assurance for when you find defects down the road. As an electric bidet seat it will not require a hot water supply to function because the seat heats the water. This one functions on an instant water heating system which will provide an endless stream of warm water. But you will need to plug the bidet into an electric outlet. Why the Brondell Swash 1400? We understand that choosing a bidet toilet seat can be overwhelming. There are many products on the market and it’s not easy to see what features you get with each product, or how reliable each brand is. To help with your decision, we put together some reasons why the Brondell Swash 1400 might be the one you’re looking for. For a luxury bidet, it does feel like there’s something missing with this bidet seat. Maybe we’ve been too spoiled by Toto’s advanced bidet seats that have automatic open and close seat and lids, and very solid, very sleek, reliable construction. Somehow this bidet seat is missing a certain wow factor. We definitely would have liked to see a slimmer, sleeker bidet seat like the Toto S550e or Toto S500e! The Swash 1000 was one of Brondell’s bestselling bidet seats, but it didn’t have some of the features that other luxury bidet seats have. So it’s nice to see the Swash 1400 with some of these features: namely, programmable user settings and a nightlight. They kept what was nice about the Swash 1000 – the clean design, nozzle sterilization, and easy-to-use remote – and added those extra features. Overall, the Brondell Swash 1400 is a good-value luxury bidet seat. You get many nice features and the wash is good, yet it won’t put too big a dent in your wallet.